After almost a week off bloggin, I am slowly warming up again. There are lots of pretty Spring make-up that I would like to show you, so let's get started. I have already posted quick swatches of Dior Kingdom of Colors Collection for Spring 2015. Today I would like to share a in-depth review, comparison swatches and FOTD of one of the two quints, Dior 5 Couleurs #856 House of Pinks. 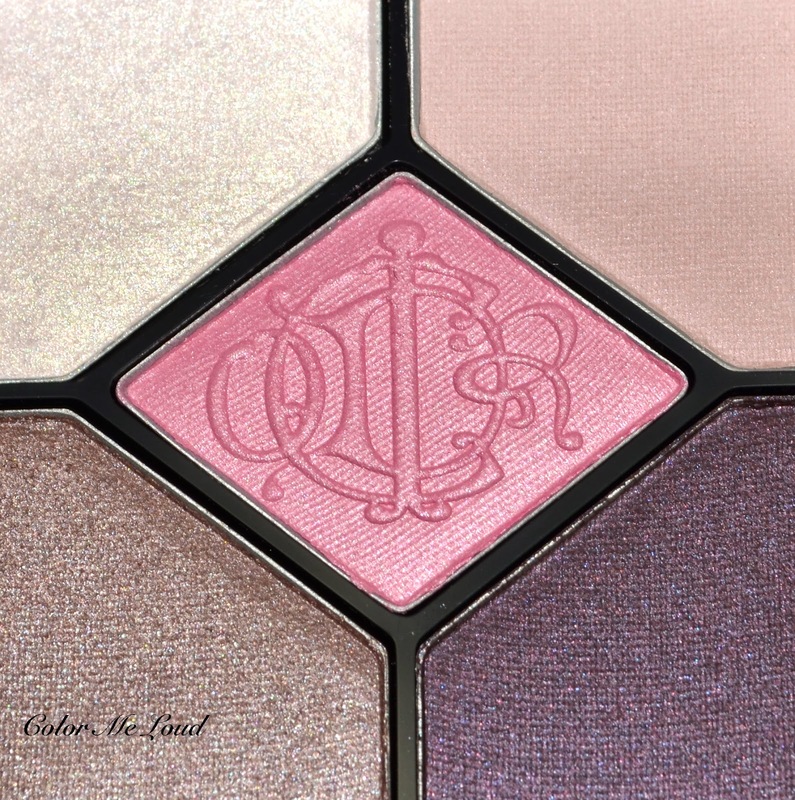 I love this when Dior does that, they release special edition of their 5 Couleurs Palettes with an embossment on the center shade. Remember last year summer, Transat Editions? That one was one hot collection, loved it! Now when I see the center shade with a super pretty vintage Dior logo, I couldn't resist. 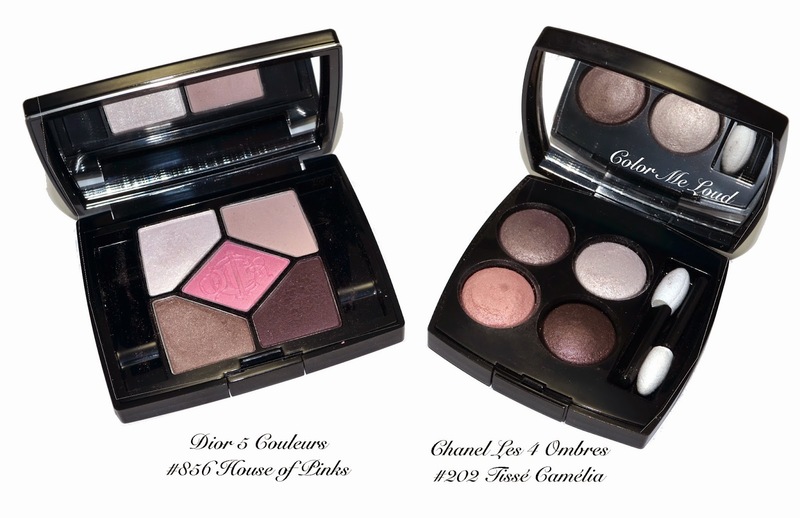 Lately I am a little cautious of Dior Palettes since I have experienced quiet a few of fall out with some of them. I am happy to report that House of Pinks is one of the better Dior Quints out there. Top left: A very light neutral white with shimmery finish. Although it is shimmery, it doesn't look frosty and the white is not too stark. Top right: A very light pink with matte finish. This is a great shade to blend the edges or use as a base. Since I have dry skin, I prefer not to use a base but I like it as a transition color over the crease. Bottom right: A very deep plum with satin finish. 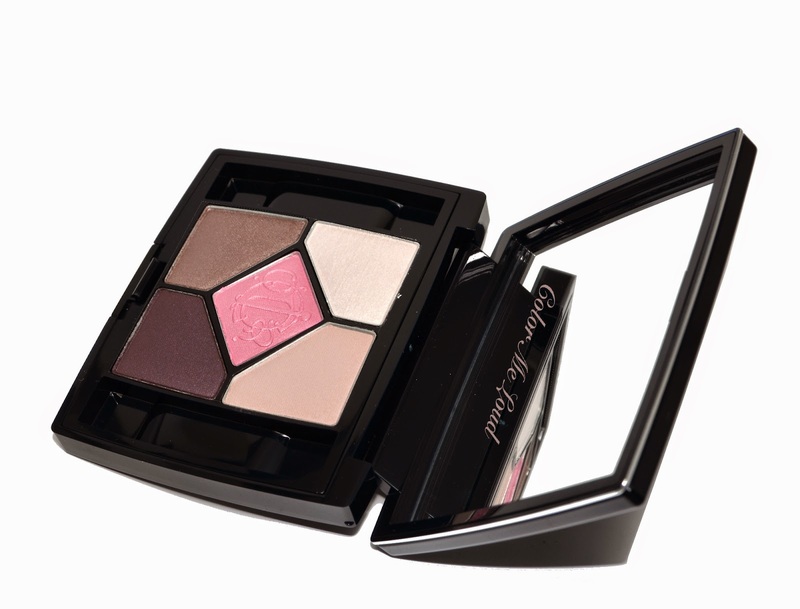 The shimmer in this one is very subtle and works great on the crease. It could also be used all over or on the outer corner. It is a very versatile shade. Bottom left: Mid-toned neutral taupe with satin to shimmery finish. This shade is my favorite in the quint, a lovely everyday swipe and go shade. I like it alone or combined with the darkest one. Middle: Mid-toned cool pink with satin to shimmery finish. It is a great pop of color if you feel like adding a little bit of something to taupe and plum combination. I haven't posted some eye looks for a while after reading some commentary in a french forum that said: "Doesn't matter if this blogger puts purples or greens on her lids, they all look the same". Needless to say that I was disappointed... Then I came to terms with it. I think the person who wrote it may like other types of blogs who use different products (e.g. Sugar Pill) and demonstrate colorful eye looks. Despite the name of the blog, I would like to make clear that I am not going for an editorial look here. These are what I wear daily. I also believe this is how many of my readers would wear it. 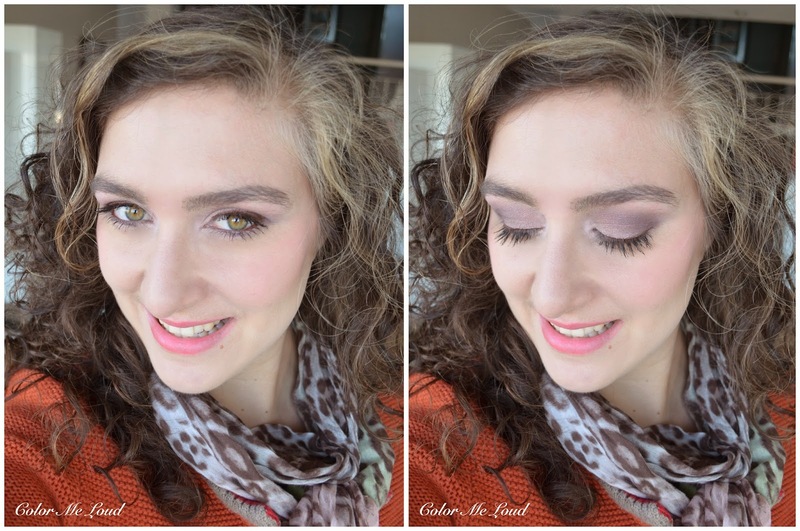 Here is a quick look using Dior House of Pinks. I have used taupe and center pink mixed for a pink taupe (does that make sense) all over the lid. I applied the darkest shade on the crease to define the look and white on the inner corner. I have blended over the crease with the matte pink from the palette as well. Below you can see this look in context. I am also wearing Dior Cheek & Lip Glow Instant Blushing Rosy Tint on my cheeks and on the lips. I will review it after my feeling settle for the product. It is so mixed at the moment, I don't know what to write. One moment I hate it the next one I love it. I generally hate it on the lips though, that is for sure. Dior 5 Couleurs #856 House of Pinks reminded me of Chanel Les 4 Ombres #202 Tissé Camélia (reviewed here), which is also a beautiful combination of taupe, pink and plum. Upon swatching I have seen that the pink in Tissé Camélia is more neutral and subtle. Taupe shades in both palettes are close, darkest shade in Tissé Camélia is denser. Dior Houses of Pinks come with an additional matte pink, which is a nice plus. I think the look both palettes give is rather close, so if you have one, you don't need the other. I slightly prefer Chanel Tissé Camélia because of the complexity of shimmer and deeper plum shade in there but like Dior for the addition of matte shade. All in all I find Dior 5 Couleurs #856 House of Pinks to be a nice addition to my stash. It is not very unique nor ground-breaking but it is one of the good formulated Dior Quints there which may make plum taupe lover's heart sing. Final thoughts: Dior 5 Couleurs #856 House of Pinks is a lovely cool toned neutral quad with a pink twist. The formula is one of Dior's best. If you don't own something similar, I would recommend checking it out. I would like to know if my blended looks give you an idea of how the quad performs or if I should blend less to show the colors one by one? We can't dispute that this is a gorgeous palette! Good to know that the formula has no glitches as well. And I agree with your observation that the inclusion of a matte shade is a good one in comparison with the chanel. I am not sure why there are so many palettes that include so many shimmery shades or all shimmery shades. Do they asume that we have our trusty mattes already at home? I always like a nice matte transition shade in the palettes. I have a few matte in my MAC Palettes but in the morning it saves me time if I can just open one palette and finish the look with it. I like blended looks. I think the great thing about seeing looks is you have an idea how the product is going to look in real life, and nobody leaves their eyeshadows unblended (or I hope not anyways)! I agree with you, I would like to see how it would look once I wear them like normal people do. Editorial stuff is nice but it is also hardly achievable with high-end cosmetics. hi sara!! don't you dare change your "format" when it comes to makeup application! i'm sure i'm not alone when i tell you i'm a working girl and i appreciate how you show, in fine detail, a beautiful, polished look that's "office friendly". i feel that many of these collections are "party" or for evening looks and, you transform them into really wearable looks. this whole collection, unfortunately, will be a pass for me. i haven't found what i'm looking for yet. i normally don't do well with spring collections since i prefer pretty much basic neutrals. anyway, i didn't pick up the cuir canage pallette. that's a possibility with a light peachy lip for me. i really liked the chanel camelia quad. but, the colors didn't show up on me at all and i'm very pale. is there a trick with those quads? i liked chanel's older formula better. anyway, alot of beauty bloggers could learn alot from you! i just wish i could "drop" everything and move to germany. i would dream to be your assistant!! xo. Aww Wendy, that is so sweet of you to say that. There is really no magic involved in the application, just the right brushes. I use very dense layering brushes for Chanel, it works wonderfully. Please get yourself a Hakuhodo G5507, it works very nicely with Chanel or other similar quads. omg!!! germany or bust!!! gee, you are sooo far away from me!! and, of course if you ever wander over to cincinnati, it's an open invitation from me!! i made a note that you recommended the hakuhodo "misty set". the only thing that makes me wary about buying from them is that if my purchase is not right, it'll be a pain to return it as compared to nordstroms. but, i'll let you know when i purchase from them. thankyou so much sara!! xxoo to you!! Lovely! I hope the green look is just as good. I've noticed some new dior quints they look so beautiful but do not translate well on the eye, powdery and muddy. I think you are right, I was also thinking it about this particular quad. 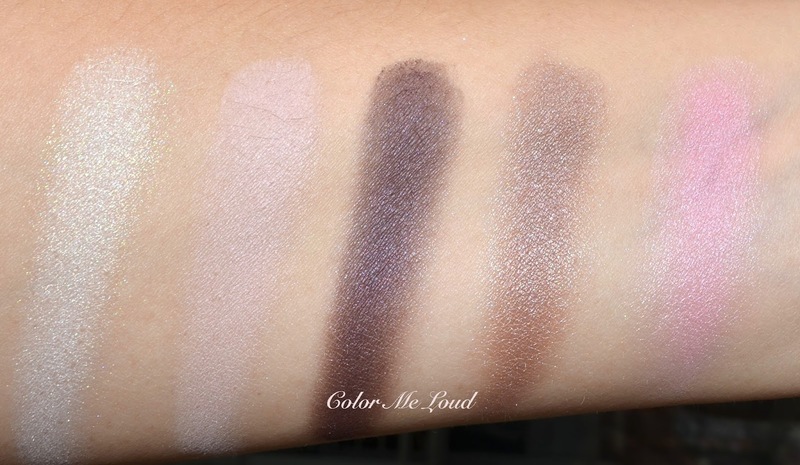 These don't layer well, if you apply just one shade it is fine, if you want to mix the shades, it starts getting muddy, Chanel works much better in this sense. I'd totally do the same combo on my eyes if I had this palette! :D You did great, Sara! Ok, I'll be honest, the palette looks nice and stuff but gosh, I'm more in love with the cheek & lip glow tint! I'm not surprised it doesn't perform well on the lips but on your cheeks - wow - absolutely gorgeous! I'll be waiting for your review! I was a little reluctant to use the bright pink, so ended up using it as a wash of color over the taupe, but it didn't show all that well since those don't layer very well. But I am happy with the result. Yes on the cheeks it looks nice if you find the right way to apply it. I will write about it soon. And it wore so long after applied, I was surprised. I like your blended looks. We get an idea of the individual colors from your swatches. That commenter on the french forum should have her eyes examined. Pay no attention to what she said. I think I prefer the Chanel to the Dior. Thank you for comparing them. I am feeling better thanks. I feel like asking to the readers from time to time to see if I can do something better or in another way. I mostly get nice comments here but I am also interested in negative ones. I really think you can differentiate between my looks, but she was claiming everything looks the same, so wanted to make sure that I am not the one with the bad sight lol. I'm so glad you finally found a Dior palette that made the cut for you! LOL! And thank you so much for the comparison with Tisse Camelia!! There was something so very familiar about House of Pink but I just couldn't pinpoint exactly which palette it reminded me of, and I thought it was just a very been-there-done-that sort of color story. I'm not very taken by this Dior collection, which will hopefully save me some money! I can't say no to taupe and plum combination so ended up getting this one but I will resist the green one for now. The big fail was the big palette from the collection, it is awful. Although I have gotten it for a reduced price, I still think it was too expensive for what I was getting. Good for you to resist it all and save for prettier collections! That pink is so pretty, I will try to use it more intensely soon and I hope it works without giving me the rabbit eye! Thanks for your honest comment. My eye lids are naturally darker than my complexions, that might be the reason why they look more muted on me. I only use Nars Pro-prime which usually doesn't change any color. I only use day light and during winter sometimes it is a little dark, that may add to it. I haven't commented for a long time because I finally gave birth to my beautiful son 16 weeks ago and he has kept me wonderfully busy. But I silently enjoyed reading your blog without commenting. This time I have to say something: please don't let this person on the french blog make you sad. I love your makeup looks!!! They are always stunning and exactly how I love eyemakeup applied. A true inspiration - in every color - and especially in purple or green 😉. Thank you for your work and your looks. And of course thank you for this post 😃. I remember you, last time you commented, you said you were about to give birth. Congratulations! It makes me happy to hear that you and your baby are doing great and you are having a special time of your life. That is a lovely pink palette !! YSL Parisienne palette also looks very similar to me. 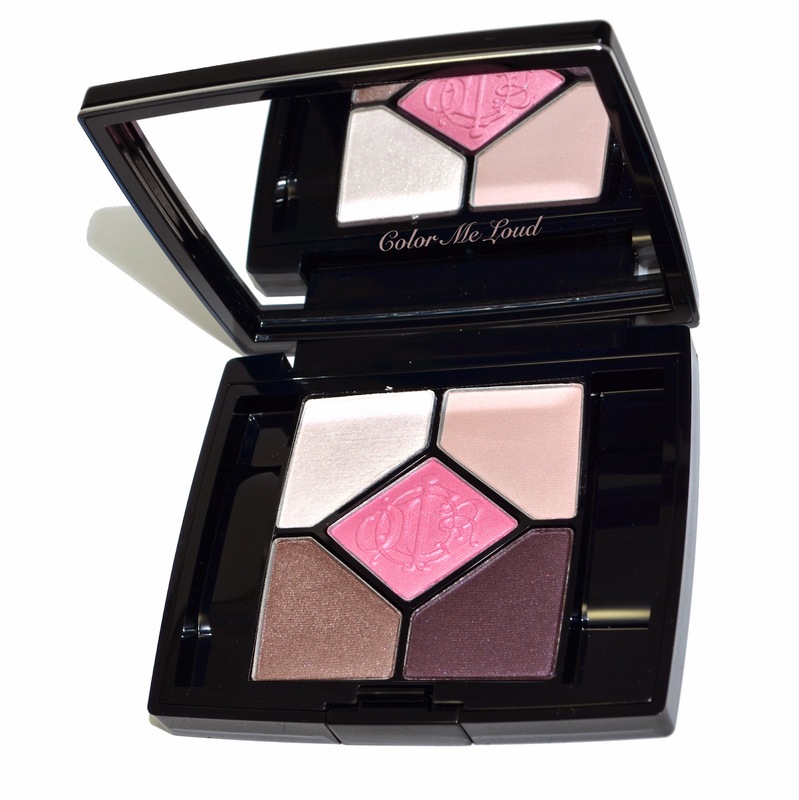 How does this Dior palette compare to the YSL Parisienne ?? You are so right! YSL Parisienne is also very very close. The only difference I see is the lack of matte shade in there and taupe in Dior being cooler. Thanks so very much, this was exactly what I was trying to achieve, not being afraid of colors, showing how wearable they are. Don't let one negative person discourage you. If you like it that's all that matters. Are you familiar with Dior's Rose Porcelain? I really wanted it, but it was on my wish list too long and has now been discontinued. The colors look similar in your swatches, but I'm wondering if the finish is the same. I was just checking out some Spring '15 collections after receiving a gift voucher - Sunny recommended checking out new upcoming spring releases to spend the voucher on. I was aiming towards a new eyeshadow palette and to be honest, this one currently appeals to me the most! It's seems subtle (apart from the matte pink which I have no idea how I'm going to wear it, it aint my colour..) and I don't own a Dior palette just yet. Thank you for your review! Ugh, don't listen to that person's negativity. I personally would not like to see extreme eyemakeup looks because honestly, who would even wear them like that on a daily basis?! I always love your looks and get lots of inspiration out of them! Please don't stop doing what you are doing. You are one of my very favourite blogs and your application is masterful. Have you considered doing a video on application techniques? I like your eyeshadow application. It's what I like and what I use too. Well, looking much less nicer. D: I'm in doubt between this one and Femme Fleur. I don't think this one is very "pink" and while Femme Fleur is more frosty, I like the colours more. You prefer this one though and many speak well of this one online. I might have to go to the counter to swatch them side by side while I can. This is the first time I have commented here, but have been meaning to do so for months. I must compliment you on your blog, yours is the blog I recommend if ever questioned regards a particular Dior shadow. Regards the comment by the French blogger, try not to allow thoughtless opinions effect you too much, it is precisely because you are so popular that you are going to draw in those who get a kick from the rash, ill thought out & possibly malicious comment, there is simply no other blogger who so decribes as accurately as yourself, & thanks to your description of this palette I will not be buying this quint, if only the white was a butterflys wing lilac like that found in the ancient Night Dust 790 it would be mine LOL. I turned my back on Diors palettes when a few years back everything they produced was aimed at the shimmer market, or simply did not have the lasting power of the earlier quints, & trawl selling platforms for quints which have one or two can´t-live-without favourite colours, but I really do need to find a modern quint which offers the colour pay-off of old, so will continue to run to you whenever I find my bidding finger itching for a new palette.